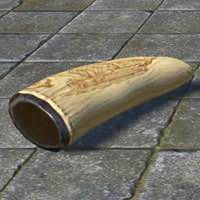 Scrimshaw, Ancient Vessel is a housing decoration made by Jewelry Crafter in The Elder Scrolls Online. Crafted, Jewelry Crafting Station. Requires Sketch: Scrimshaw, Ancient Vessel. Sketches are found randomly in containers around tamriel, and can be traded and sold by players. Some special sketches are only availble from pickpocketing or as special rewards.